Since receiving an Understanding British Portraits bursary, I have been undertaking research trips relating to my work on the eighteenth-century wax modeller, Samuel Percy. Born in Ireland in c.1750, Percy received his early artistic training at the Dublin Society school of art. As with many artists seeking a profitable career, he moved to London in the 1770s, yet pursued an itinerant lifestyle travelling around Britain and Ireland taking likenesses in wax. I have had a longstanding interest in eighteenth-century painted portraiture; however, it was not until I started working in the Sculpture department at the V&A that I discovered the neglected genre of wax portraiture and was immediately fascinated by them. Despite these assertions, wax modelling was an art form that flourished in late eighteenth-century Britain. Wax was easily modelled and cast, and the addition of colour enabled artists to accurately re-create fleshy skin tones, intricate hair styles and exquisite representations of jewels and clothing. Portraits were usually taken from the life, and were particularly desired for the verisimilitude the medium offered. This form of portraiture would have been seen in the homes of the middling classes, but were also admired and commissioned by the nobility and Royalty. In one of the few published works on wax portraiture in the twentieth century, the art historian Julius Von Schlosser wrote that ‘there can be no doubt that portraiture in wax, with its permanent, inherent tendency to naturalism, served the function that in due course was likewise served by the truly middle-class art of modern times, namely photography’. 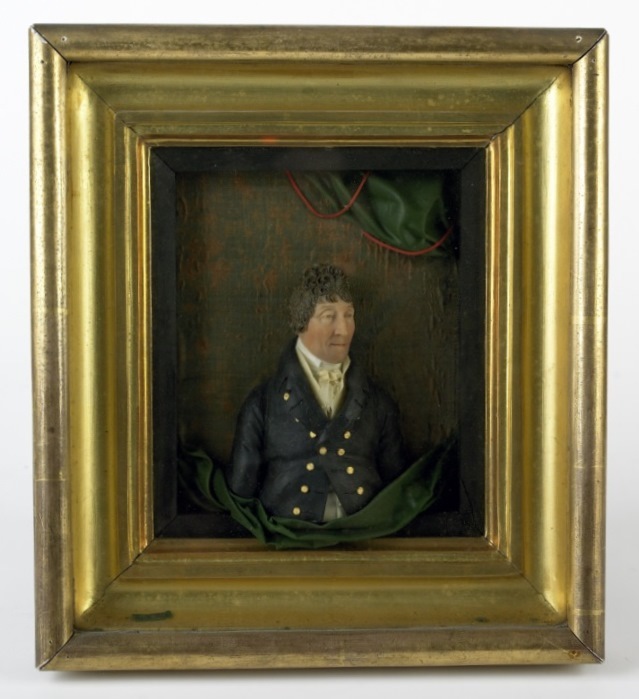 Percy was one of the most prolific and successful wax portrait modellers, and was particularly known for his high relief polychrome works that were admired for their exact likenesses. In February, I travelled to Northern Ireland to visit The Argory, a National Trust property that I had discovered had an unknown, unattributed Percy portrait. I had stumbled across this wax when undertaking a search on the National Trust’s Collections Online website, under a search term of ‘wax’. After an hour or so perusing stumps of candles, wax dolls and wax impressions from seals, I came across this exciting find, and hoped that I had discovered a previously unpublished portrait by Percy. The majority of attributed Percy waxes are held in museum collections; as part of this project I was very keen to find an example that had been commissioned from Percy and that had remained in the same family collection ever since. I contacted the National Trust’s Curator for Northern Ireland, Demelza Williams (a fellow UBP bursary award holder), and the House Steward, Matthew Morrison. They both kindly met me at The Argory on a very cold day. The house was still in its winter hibernation state and closed to the public, so I felt very privileged that they made it possible for me to visit, and for opening a large number of shutters so that we could see what we were doing! Luckily, we didn’t have to rely on my eye alone when confirming my belief that the wax was indeed by Samuel Percy as it was signed on the reverse! A large number of Percy’s waxes include a hand written, or later printed, set of instructions on how to display the portrait. Typically the text reads: ‘To see these Portraits to advantage, Hold the Top of the Frame parallel to the window, that all the features may catch equal Light and Shadow.’ The Argory wax is signed and dated ‘S. Percy 1811’. What was rather exciting for me was to be able to hold the wax up, as Percy had instructed, in a setting which has remained largely unchanged since the house was built in the early 1820s. 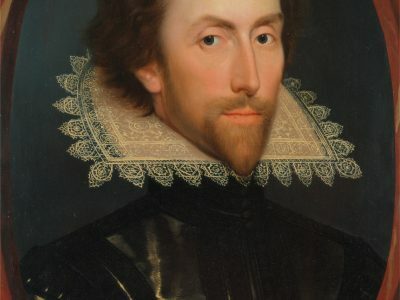 The effect was quite extraordinary as the subject’s features came alive and we were able to see minute details such as a shadow of stubble on the gentleman’s chin, as well as the exquisite modelling of his facial features and clothing. It was a very different experience from that of being in the V&A’s basement store looking at the waxes under unsympathetic strip lighting. The next challenge was to determine who the subject of the portrait was. Although we had confirmed it was definitely by Samuel Percy, it could have been acquired at any point and was not necessarily of a member of the family associated with The Argory – the McGeoughs. We scrutinised various painted portraits on display in the house and all felt that there was a marked similarity to a painted portrait of Joshua McGeough by the eighteenth-century Irish artist, Joseph Wilson. Joshua had never lived at The Argory – his son built the house after his death – however Joshua’s home, Drumsill House, was not far away. Although we all agreed that the wax could be of Joshua, I wanted to find some evidence to support this, and that afternoon registered for a reader’s card at the Public Record Office (PRONI) in Belfast where a large amount of the McGeough family papers have been deposited. Hopes were high as always at the beginning of a task such as this, but after a couple of hours spent scouring letters and account books, estate records and solicitors’ correspondence, I was starting to lose hope that I would find anything. However, I struck lucky when I got to the last box which contained a number of eighteenth and nineteenth-century house inventories of The Argory and Drumsill House. In an inventory taken on February 23rd to 24th 1894, listed as being in the Library was the following item: ‘Wax Picture in Gilt Frame (Joshua McGeough) £20.0.0’. Unfortunately I could find no record of the original commission, despite the fact that Joshua appeared to be an excellent record keeper, and a hoarder of receipts. I can only assume that the value of the wax was so low that either a receipt wasn’t provided, or wasn’t important enough to be kept. The wax portrait must have been transferred to The Argory in 1916 when Drumsill House was sold by the family and the contents moved to The Argory. Discovering and attributing an unknown wax is exciting, but it is only the start of my research. Although I am using Percy as my case study, I am keen to assess these portraits in light of the wider study of eighteenth-century portraiture, and gain an understanding of who was commissioning these works; why they were so popular; and the nature of a successful modeller’s business.